To view my publications by publication types, please see CV. Papers on this page are distributed as a service to the scholarly community to facilitate academic interaction. Feel free to email me if you want a copy of unlinked files. Kawahara, Shigeto and Jeff Moore (under review) Exploring sound symbolic knowledge of English speakers using Pokémon character names. Kawahara, Shigeto, Michinori Suzuki and Gakuji Kumagai (under review) Sound symbolic patterns in Pokémon move names. Shaw, Jason and Shigeto Kawahara (2018) What we know about what we've never heard: Evidence from production. Poster presented at AMP 2018. Kawahara, Shigeto (ms, version 2017) Opacity in Japanese (a chapter in my future CUP book). Kawahara, Shigeto and Gakuji Kumagai (2019) Expressing Evolution in Pokémon Names: Experimental Explorations. Journal of Japanese Linguistics. Kawahara, Shigeto and Gakuji Kumagai (2019) Inferring Pokémon types using sound symbolism: The effects of voicing and labiality. Journal of Phonetic Society of Japan. Kawahara, Shigeto (2019) Teaching phonetics through sound symbolism. Proceedings of ISAPh. Kawahara, Shigeto, Hironori Katsuda and Gakuji Kumagai (2019) Accounting for the stochastic nature of sound symbolism using Maximum Entropy model. Open Linguistics. 熊谷学而・川原繁人 (2019) ポケモン名付けにおける母音と有声阻害音効果: 実験と理論からアプローチ. 言語研究 155. 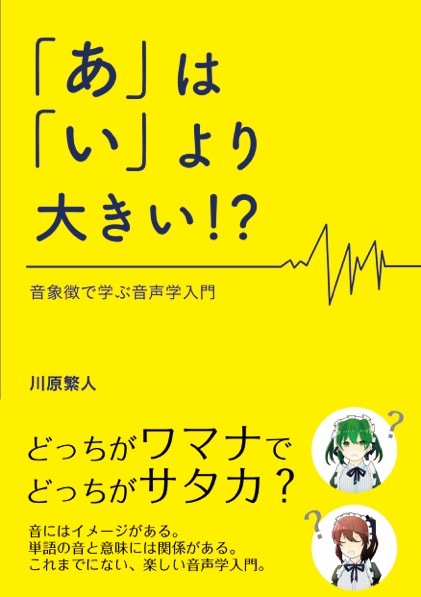 Kawahara, Shigeto, Miwa Isobe, Yukino Kobayashi, Tomoko Okabe, Reiko Okabe, and Yasuyo Minagawa (2019) Acquisition of the takete-maluma effect by Japanese speakers. REPORTS of the Keio Institute of Cultural and Linguistic Studies 50: 63-78. 川原繁人 ・桃生朋子 (2019)「マイボイス」を使って音声学を教える有効性について：アンケート調査の報告. 音声研究 23. Kilpatrick, Alexander, Shigeto Kawahara, Rikke Bundgaard-Nielsen, Brett Baker and Janet Fletcher (2019) Japanese coda [m] elicits both perceptual assimilation and epenthesis. Proceedings of ISAPh. Lee, Seunghun, Shigeto Kawahara, Céleste Guillemot & Tomoko Monou (2019) Acoustics of the four-way laryngeal contrast in Drenjongke (Bhutia): Observations and implications. Journal of the Phonetic Society of Japan. 川原繁人 (2018) 『ビジュアル音声学』. 東京: 三省堂. 補足・教材. 川原繁人・高田三枝子・松浦年男・松井理直（2018） 有声性の研究はなぜ重要なのか. 音声研究 22(2): 56-68. Kawahara, Shigeto, Miwa Isobe, Yukino Kobayashi, Tomoko Monou and Reiko Okabe (2018) Acquisition of sound symbolic values of vowels and voiced obstruents by Japanese children: Using a Pokémonastics paradigm. Journal of the Phonetic Society of Japan 22(2): 122-130. Shaw, Jason and Shigeto Kawahara (2018) Assessing surface phonological specification through simulation and classification of phonetic trajectories. Phonology 35(3): 481–522. Link to the published version. Kawahara, Shigeto and Jason Shaw (2018) Persistence of prosody. Bennett, Ryan, Andrew Angeles, Adrian Brasoveanu, Dhyana Buckley, Shigeto Kawahara, Grant McGuire, and Jaye Padgett (eds.) Hana-bana: A Festshrift for Junko Ito and Armin Mester. Shaw, Jason and Shigeto Kawahara (2018) Consequences of high vowel deletion for syllabification in Japanese. Proceedings of AMP 2017. Shaw, Jason and Shigeto Kawahara (2018) The lingual gesture of devoiced /u/ in Tokyo Japanese. Journal of Phonetics 66: 100-118. Shaw, Jason and Shigeto Kawahara (2018)The Role of Predictability in Shaping Human Language Sound Patterns. Linguistics Vanguard, special issue. Shaw, Jason and Shigeto Kawahara (2018) Predictability and phonology: Past, present and future. Linguistics Vanguard 4(S2): 1-9. Kawahara, Shigeto and Seunghun Lee (2018) Truncation in Message-Oriented Phonology: A case study using Korean vocative truncation. Linguistics Vanguard 4(S2): 1-8. 川原繁人 (2018)　Science Column 3: なぜヒップホップのメッセージは胸を打つのか---１万分の１の奇跡がもたらす効果とは.『筋トレ×ヒップホップが最強のソリューションである』文響社. Kawahara, Shigeto (2018) Phonology and orthography: The orthographic basis of rendaku and Lyman’s Law. Glossa 3(1). PDF. 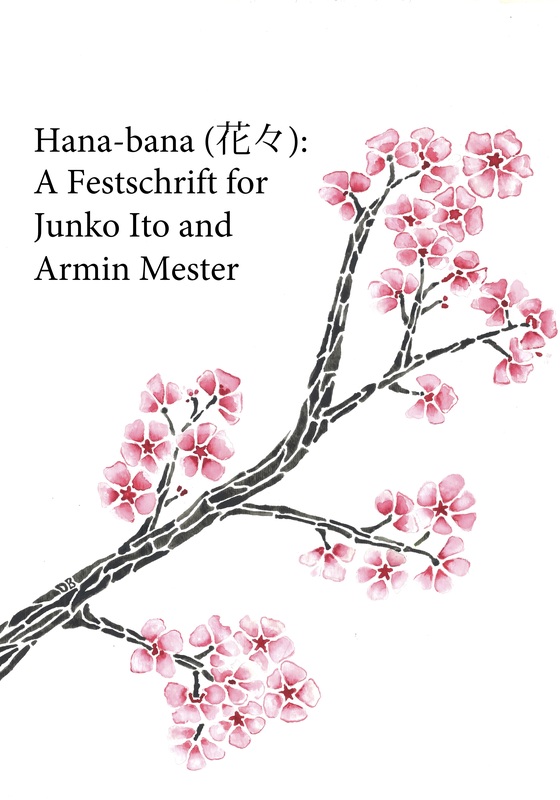 Bennett, Ryan, Andrew Angeles, Adrian Brasoveanu, Dhyana Buckley, Shigeto Kawahara, Grant McGuire, and Jaye Padgett (2018) Hana-bana: A festschrift for Junko Ito and Armin Mester. Hall, Erin, Peter Jurgec, and Shigeto Kawahara (2018) Opaque allomorph selection in Japanese and Harmonic Serialism: A reply to Kurisu (2012). Linguistic Inquiry 49(3): 599-610. Lee, Seunghun, Hyun Kyung Hwang, Tomoko Monou, and Shigeto Kawahara (2018) The phonetic realization of tonal contrast in Dränjongke. Proceedings of TAL 2018: 217-221. Lee, Seunghun and Shigeto Kawahara (2018) The phonetic structure of Dzongkha: A preliminary study. Journal of the Phonetic Society of Japan 22(1): 13-20. Funakoshi, Kenshi, Shigeto Kawahara and Christopher Tancredi (eds.) 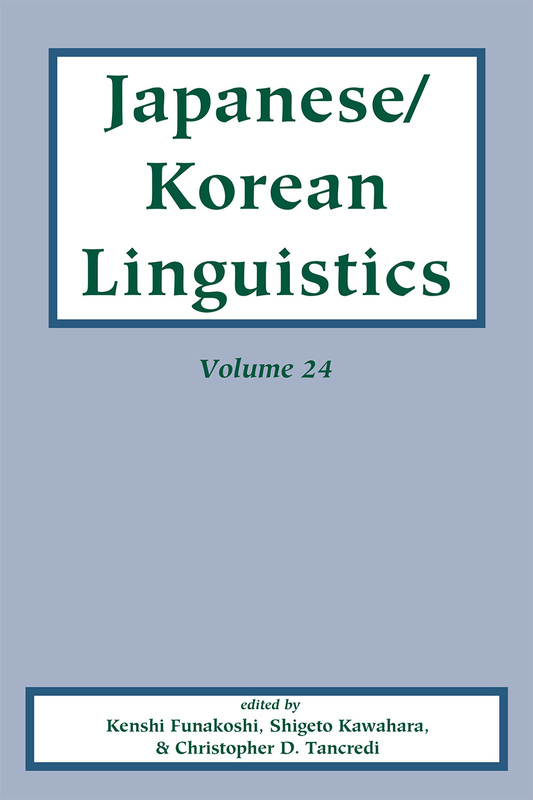 (2018) Japanese Korean Linguistics 24. Stanford: CSLI. Kumagai, Gakuji and Shigeto Kawahara (2018) Stochastic phonological knowledge and word formation in Japanese. Journal of the Linguistic Society of Japan 153: 57-83. 川原繁人・桃生朋子 (2018) 音象徴で言語学を教える: 具体的成果の紹介を通して. Southern Review 32: 3-14. Kawahara, Shigeto (2018) Durational vowel-coda interaction in spontaneous Japanese utterances. Acoustical Science and Technology 39(2): 138-139. Moore, Jeff, Jason Shaw, Shigeto Kawahara, & Takayuki Arai (2018) Articulation strategies for English liquids used by Japanese speakers. Acoustic Science and Technology 39(2): 75-83. 桃生朋子・川原繁人 (2018) マイボイスと大学言語学教育. REPORTS of the Keio Institute of Cultural and Linguistic Studies 49: 97-107. 小林 ゆきの・磯部 美和・ 桃生 朋子・ 岡部 玲子・ 川原 繁人（2018) 幼児はポケモン名付けに音象徴を用いるか. 日本言語学会第155回全国大会予稿集. Perkins, Jeremy, Seunghun Lee, Shigeto Kawahara and Tomoko Monou (2018) Consonants and tones: A view from two Tibeto-Burman languages. 日本言語学会第155回全国大会予稿集. Kilpatrick Alexander, Shigeto Kawahara, Rikke L. Bundgaard-Nielsen, Brett J. Baker and Janet Fletcher1 (2018) Japanese vowel devoicing modulates perceptual epenthesis. Proceedings of SST 2018. 川原繁人 (2017) 『「あ」は「い」より大きい!?:音象徴で学ぶ音声学入門』. 東京: ひつじ書房. 補足・教材. Erickson, Donna and Shigeto Kawahara (2017) In Memoriam: Osamu Fujimura. Phonetica. 74(4): I-IV. Kawahara, Shigeto and Melanie Pangilinan (2017) Spectral continuity, amplitude changes, and perception of length contrasts. In H. Kubozono (ed.) Aspects of Geminate Consonants. Oxford: Oxford University Press. pp. 13-33. Kawahara, Shigeto & Michinao F. Matsui (2017) Some aspects of Japanese consonant articulation: A preliminary EPG study. ICU Working Papers in Linguistics II: 9-20. 川原繁人 (2017) ドラゴンクエストの呪文における音象徴: 音声学の広がりを目指して. 音声研究 21(2): 38-42. Matsui, Mayuki, Yosuke Igarashi, and Shigeto Kawahara (2017) Acoustic manifestation of Russian word-final devoicing in utterance-medial position. Journal of the Phonetic Society of Japan 21(2): 1-17. 遠藤希美・川原繁人・皆川泰代 (2017) 声楽的発声における母音知覚—基本周波数および声楽経験の影響—. 音声研究 21(2): 25-37. 川原繁人・桃生朋子 (2017) 音象徴の言語学教育での有効利用に向けて: 『ウルトラマン』の怪獣名と音象徴. 音声研究 21(2): 43-49. Erickson, Donna, Kiyoshi Honda and Shigeto Kawahara (2017) Interaction of jaw displacement and F0 peak in syllables produced with contrastive emphasis. Acoustical Science and Technology 38(3): 137-146. Kawahara, Shigeto, Donna Erickson, and Atsuo Suemitsu (2017) The phonetics of jaw displacement in Japanese vowels. Acoustical Science and Technology 38(2): 99-107. Kawahara, Shigeto (2017) A bootstrap-based reanalysis of Zamma (2013). The R-code for bootstrapping. My humble obituary. REPORTS of the Keio Institute of Cultural and Linguistic Studies 48: 221-225. Matsui, Michinao (2017) (Translated by Shigeto Kawahara). On the input information of the C/D model for vowel devoicing in Japanese. Journal of the Phonetic Society of Japan 21(1): 129-140. 川原繁人 (2017) 日本語ラップの韻分析再考二〇一七――言語分析を通して韻を考える――. 日本語学 36(11): 2-12. 川原繁人 ・三間英樹 (2017) 生成音韻論における連濁の理論的分析. 『連濁の研究』. 開拓社. pp. 95-128. 川原繁人 ・竹村亜希子 (2017) 連濁の心理言語学的研究. 『連濁の研究』. 開拓社. pp. 129-145. 熊谷学而・川原繁人 (2017) 音象徴の抽象性：赤ちゃん用オムツのネーミングにおける唇音. 音声学会第31回全国大会予稿集. pp.49-54. 熊谷学而・川原繁人 (2017) ポケモンのネーミングにおける母音と有声阻害音の効果. 日本言語学会第155回全国大会予稿集. pp.127-132. 川原繁人・川原睦人・熊井 規 (2017) 声道模型における共鳴の有限要素法解析. 音声学会第31回全国大会予稿集. pp. 67-72. Lee, Seunghun, Shigeto Kawahara, Haruka Tada and Hanna Kaji (2017) A preliminary acoustic study of tone in Dzongkha. 音声学会第31回全国大会予稿集. pp. 114-119. Lee, Seunghun, Shigeto Kawahara, Hanna Kaji and Haruka Tada (2017) The acoustic manifestation of laryngeal contrasts in Dzongkha: A preliminary study. Proceedings of SICSS 2017. 川原繁人・桃生朋子・皆川泰代 (2016) マイボイスと大学における音声学教育. 音声研究 20(3): 13-20. Kawahara, Shigeto (2016) Japanese has syllables: A reply to Labrune (2012). Phonology 33(1): 169–194. Erickson, Donna, Chunyue Zhu, Shigeto Kawahara, and Atsuo Suemitsu (2016) Articulation, acoustics and perception of Mandarin Chinese emotional speech. Open Linguistics 2: 620–635. Kawahara, Shigeto (2016) Japanese geminate devoicing once again: Insights from Information Theory. Proceedings of Formal Approaches to Japanese Linguistics 8: 43-62. Shinohara, Kazuko, Naoto Yamauchi, Shigeto Kawahara, and Hideyuki Tanaka (2016) Takete and maluma in action: A cross-modal relationship between gestures and sounds. PLOS ONE. Go to the publication page. Kawahara, Shigeto (2016) The prosodic features of “tsun” and “moe” voices. Journal of the Phonetic Society of Japan 20(2): 102-110. Kawahara, Shigeto (2016) Psycholinguistic methodology in phonological research (pre-print version). Oxford Bibliography Online. For discussion on Japanese verbal paradigms, which I removed as per reviewer’s request, click here.The published version is available from here. Erickson, Donna and Shigeto Kawahara (2016) Articulatory correlates of metrical structure: Studying jaw displacement patterns. Linguistics Vanguard 2: 103-118. Kawahara, Shigeto and Shin-ichiro Sano (2016) /p/-driven geminate devoicing in Japanese: Corpus and experimental evidence. Journal of Japanese Linguistics 32: 57-77. Takahashi, Chika and Shigeto Kawahara (2016) Can Japanese speakers compensate for coaritulation due to [l] and [r]? Formal Approaches to Japanese Linguistics 8, Mie University. 川原繁人・本間武蔵・吉村隆樹・荒井隆行 (2016) マイボイス・プロジェクト—自分の声を大切に考えた人たちの物語—. 日本音響学会誌 72.10: 653-661. The English version, “MyVoice: Rescuing voices of ALS patients” Acoustical Science and Technology 37(5): 202-210. 松井理直・川原繁人・シャージェイソン (2016) EPG を用いた日本語歯茎促音の調音的特徴. 音声学会全国大会予稿集. Monou, Tomoko and Shigeto Kawahara (2016) The role of the Subset Principle in L2 acquisition: A case study of Japanese and Mandarin Chinese. REPORTS of the Keio Institute of Cultural and Linguistic Studies 47: 113-141. Shinohara, Kazuko and Kawahara, Shigeto (2016) A cross-linguistic study of sound symbolism: The images of size. The proceedings of BLS 36: 396-410. Berkeley Linguistic Society: Berkeley. Braver, Aaron and Shigeto, Kawahara (2016) Incomplete neutralization in Japanese monomoraic lengthening. Proceedings of Phonology 2014. Online publication. Braver, Aaron, Natalie Dresher and Shigeto, Kawahara (2016) The phonetics of emphatic vowel lengthening in English. Proceedings of Phonology 2014. Online publication. Kawahara, Shigeto and Hideki Zamma (2016) Generative treatments of rendaku. In Timothy Vance and Mark Irwin (eds.) 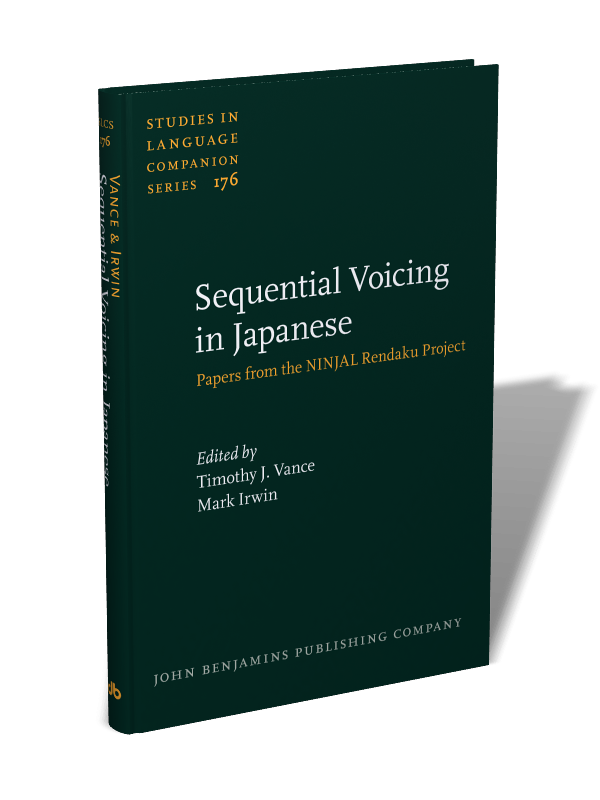 Sequential voicing in Japanese compounds: Papers from the NINJAL Rendaku Project. Amsterdam: John Benjamins. pp.13-34. Kawahara, Shigeto and Shin-ichiro Sano (2016) Rendaku and identity avoidance: Consonantal identity and moraic identity. In Timothy Vance and Mark Irwin (eds.) Sequential voicing in Japanese compounds: Papers from the NINJAL Rendaku Project. Amsterdam: John Benjamins. pp.47-55. 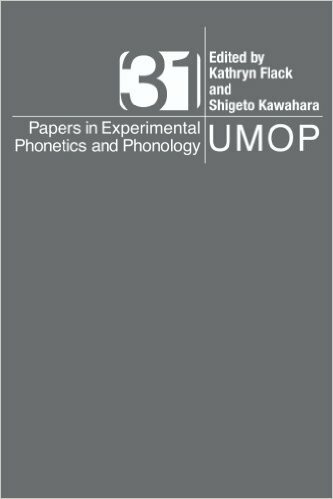 Shigeto Kawahara (2016) The phonetics of [voice] in singletons and geminates in Japanese: An acoustic and electroglottography study. Ms.
川原繁人 (2015) 「音とことばのふしぎな世界」. 岩波サイエンスライブラリー 244. 東京 : 岩波書店. 編集部宣伝. 補足・教材. Kawahara, Shigeto (2015) Japanese /r/ is not featureless: A rejoinder to Labrune (2014) Open Linguistics 1: 432-443. Kawahara, Shigeto (2015) The phonetics of geminates: An overview. “Geminate consonants across the world”, A satellite workshop for ICPhS 2015. Kawahara, Shigeto (2015) Geminate devoicing in Japanese loanwords: Theoretical and experimental investigations. Language and Linguistic Compass 9(4): 168–182. Kawahara, Shigeto (2015) Can we use rendaku for phonological argumentation? Linguistics Vanguard 1: 3-14. Go to theirwebsite. Kawahara, Shigeto (2015) Comparing a forced-choice wug test and a naturalness rating test: An exploration using rendaku. Language Sciences 48: 42-47. Kawahara, Shigeto (2015) The phonetics of sokuon, obstruent geminates. In Haruo Kubozono (ed.) The Handbook of Japanese Language and Linguistics: Phonetics and Phonology. Mouton. pp. 43-73. Kawahara, Shigeto (2015) The phonology of Japanese accent. In Haruo Kubozono (ed.) The Handbook of Japanese Language and Linguistics: Phonetics and Phonology. Mouton. pp.445-492. Braver, Aaron and Shigeto, Kawahara (2015) Incomplete neutralization via paradigm uniformity and weighted constraints. Proceedings of North Eastern Linguistics Society 45. GLSA. pp.115-124. Kawahara, Shigeto, Donna Erickson, and Atsuo Suemitsu (2015) Edge prominence and declination in Japanese jaw displacement patterns: A view from the C/D model. A special issue on the C/D model, Journal of the Phonetic Society of Japan 19(2): 33-43. Kawahara, Shigeto (2015) The C/D model as a theory of the phonetics-phonology interface. A special issue on the C/D model, Journal of the Phonetic Society of Japan 19(2): 9-15. Erickson, Donna and Shigeto Kawahara (2015) A practical guide to calculating syllable prominence, timing and boundaries in the C/D model.. A special issue on the C/D model, Journal of the Phonetic Society of Japan 19(2): 16-21. 川原繁人・本間武蔵・今関祐子・吉村隆樹・荻原萌・深澤はるか・増田斐那子・篠原和子・杉岡洋子・杉山由希子 (2015) マイボイス:言語学が失われる声を救うために. 日本音韻論学会 (編) 音韻研究 18. 東京：開拓社. pp.127-136. Fukazawa Haruka, Shigeto Kawahara, Mafuyu Kitahara and Shin-ichiro Sano (2015) Two is too much: Geminate devoicing in Japanese. In Phonological Society of Japan (ed.) Phonological Studies 18. Tokyo: Kaitakusha. pp.3-10. Kawahara, Shigeto (2015) A catalogue of phonological opacity in Japanese. REPORTS of the Keio Institute of Cultural and Linguistic Studies 46: 145-174. Kawahara, Shigeto, Kazuko Shinohara and Joseph Grady (2015) Iconic inferences about personality: From sounds and shapes. In Masako K. Hiraga, William J. Herlofsky, Kazuko Shinohara and Kimi Akita (eds.) Iconicity: East meets west. John Benjamins: Amsterdam. pp. 57-69. Erickson, Donna, Jangwon Kim, Shigeto Kawahara, Caroline Menezez, Atsuo Suemitsu, Jeff Moore (2015) Bridging articulation and perception: The C/D model and contrastive emphasis. Proceedings of ICPhS 2015. 川原繁人・竹村亜希子 (2015) 連濁は音韻理論の問題か. 西原哲雄 (編) 現代の形態論と音声学・音韻論の視点と論点. 開拓社. pp. 212-235. Kawahara, Shigeto and Mika Igarashi (2014) Proceedings of FAJL 7. MITWPL. Front Matters. Buy a copy. Kawahara, Shigeto and Aaron Braver (2014) Durational properties of emphatically-lengthened consonants in Japanese. Journal of International Phonetic Association 44(3): 237-260. A link to the CUP page. Kawahara, Shigeto and Kelly Garvey (2014) Nasal place assimilation and the perceptibility of place contrasts. Open Linguistics 1: 17-36. Kawahara, Shigeto and Shin-ichiro Sano (2014) Identity Avoidance and Lyman's Law. Lingua 150: 71-77. Hara, Yurie, Kawahara, Shigeto, and Yuli Feng (2014) The prosody of enhanced bias in Mandarin and Japanese negative questions. Lingua 150: 92-116. Lee Sang-Im, Kawahara, Shigeto and Seunghun J. Lee (2014) The “whistled” fricative in Xitsonga: its articulation and acoustics. Phonetica 71(1): 51-80. John Kingston, Kawahara, Shigeto, Della Chambless, Michael Key, Daniel Mash, and Sarah Watsky (2014) Context effect as auditory contrast. Attention, Perception, & Psychophysics 76(5): 1437-1464. Syrett, Kristen and Kawahara, Shigeto (2014) Production and perception of listener-oriented clear speech in child language. Journal of Child Language 41: 1373 - 1389. Kawahara, Shigeto and Shin-ichiro Sano (2014) Testing Rosen's Rule and Strong Lyman's Law. NINJAL Research Papers 7: 111-120. Kawahara, Shigeto and Shin-ichiro Sano (2014) Identity avoidance and rendaku. Proceedings of Phonology 2013. Online publication. Braver, Aaron and Kawahara, Shigeto (2014) Incomplete vowel lengthening in Japanese: A first study. Proceedings of the 31st meeting of West Coast Conference on Formal Linguistics. pp.86-95. Sommerville: Cascadilla Press. Kawahara, Shigeto, Donna Erickson, Jeff Moore, Atsuo Suemitsu and Yoshiho Shibuya (2014) Jaw displacement and metrical structure in Japanese: The effect of pitch accent, foot structure, phrasal stress. Journal of the Phonetic Society of Japan 18(2): 77-87. Kawahara, Shigeto, Hinako Masuda, Donna Erickson, Jeff Moore, Atsuo Suemitsu and Yoshiho Shibuya (2014) Quantifying the effects of vowel quality and preceding consonants on jaw displacement: Japanese data. Journal of the Phonetic Society of Japan 18(2): 54-62. Erickson, Donna, Kawahara, Shigeto, J, Atsuo Suemitsu, Yoshiho Shibuya, and Mark Tiede (2014) Comparison of jaw displacement patterns of Japanese and American speakers of English: A preliminary report. Journal of the Phonetic Society of Japan 18(2): 88-94. Erickson, Donna, Kawahara, Shigeto, Jeff Moore, Atsuo Suemitsu, and Yoshiho Shibuya (2014) Metrical structure and jaw displacement: An exploration. Proceedings of Speech and Prosody 2014: 300-303. Erickson, Donna, Kawahara, Shigeto, Jeff Moore, Caroline Menezes, Atsuo Suemitsu, Jangwon Kim and Yoshiho Shibuya (2014) Calculating articulatory syllable duration and phrase boundaries. Proceedings of The 10th International Seminar on Speech Production (ISSP): 102-105. 篠原和子・川原繁人・本間武蔵 (2014) 身体としての言語 第28回人口知能学会全国大会. 2D5-OS-28b-3. Takemura, Akiko, Itsue Kawagoe and Shigeto Kawahara (2014) The perception of gemination in English word-internal clusters by Japanese listeners: A case for phonetically-driven loanword adaptation. Proceedings of FAJL 7. MITWPL. pp. 227-237. Kawahara, Shigeto and Shin-ichiroo Sano (2013) A corpus-based study of geminate devoicing in Japanese: Linguistic factors. Language Sciences 40: 300-307. Kawahara, Shigeto (2013) Testing Japanese loanword devoicing: Addressing task effects. Linguistics 51(6): 1271 – 1299. Kawahara, Shigeto (2013) Emphatic gemination in Japanese mimetic words: A wug-test with auditory stimuli. Language Sciences 40: 24-35. Coetzee, Andries and Kawahara, Shigeto (2013) Frequency biases in phonological variation. Natural Language and Linguistic Theory. 31(1): 47-89. Kawahara, Shigeto and Aaron Braver (2013) The phonetics of emphatic vowel lengthening in Japanese. Open Journal of Modern Linguistics 3(2): 141-148. Open Access version. 川原繁人 (2013) 日本語特殊拍の音響と知覚ー促音を中心としてー日本音響学会誌. 69(04): 191-196. Shinohara, Kazuko and Kawahara, Shigeto (2013) The sound symbolic nature of Japanese maid names. The proceedings of JCLA 13. Japan Cognitive Linguistics Association. pp. 183-193. Kawahara, Shigeto (2013) The phonetics of Japanese maid voice I: A preliminary study. 音韻研究 (Phonological Studies) 16: 19-28. Monou, Tomoko and Kawahara, Shigeto (2013) The emergence of the unmarked in L2 acquisition: interpreting null subjects. Proceedings of the Tokyo Conference on Psycholinguistics (TCP) 14. pp.181-200. Tokyo: Hitsuji Shobo. Deprez, Viviane, Kristen Syrett, and Kawahara, Shigeto (2013) The interaction of syntax, prosody, and discourse in licensing French wh-in-situ questions. Lingua 124: 4-19. Kawahara, Shigeto (2012) Lyman's Law is active in loanwords and nonce words: Evidence from naturalness judgment studies. Lingua 122(11): 1193-1206. Kawahara, Shigeto and Sophia Kao (2012) The productivity of a root-initial accenting suffix, [-zu]: Judgment studies. Natural Language and Linguistic Theory. 30(3): 837-857. Kawahara, Shigeto (2012) A review of The Phonology of Japanese (by Laurence Labrune, 2012 Oxford University Press). Phonology . 29(3): 540-548. Get the PDF file. Kawahara, Shigeto (2012) Amplitude changes facilitate categorization and discrimination of length contrasts. IEICE Technical Report. THE INSTITUTE OF ELECTRONICS, INFORMATION AND COMMUNICATION ENGINEERS　112: 67-72. Deprez, Viviane, Kristen Syrett, and Kawahara, Shigeto (2012) Interfacing information and prosody: French wh-in-situ questions. In I. France, S. Lusini and A. Saab. Romance Languages and Linguistic Theory 2010. John Benjamins: Amsterdam. pp. 135–154. Kawahara, Shigeto (2012) 外来語有声促音の無声化‐理論的貢献‐. 音韻研究 (Phonological Studies) 15: 93-104. Hara, Yurie and Kawahara, Shigeto (2012) The prosody of public evidence in Japanese: A rating study. Proceedings of the 29th meeting of West Coast Conference on Formal Linguistics. pp.353-361. Sommerville: Cascadilla Press. Borowsky, Toni, Kawahara, Shigeto, Takahito Shinya, and Mariko Sugahara (eds.) (2012) Prosody Matters: Essays in honor of Elisabeth Selkirk. Equinox Publishing. London. The flier. Review by S. Frota and M. Vigário (2013), Phonology 30. A CUP link to the article. 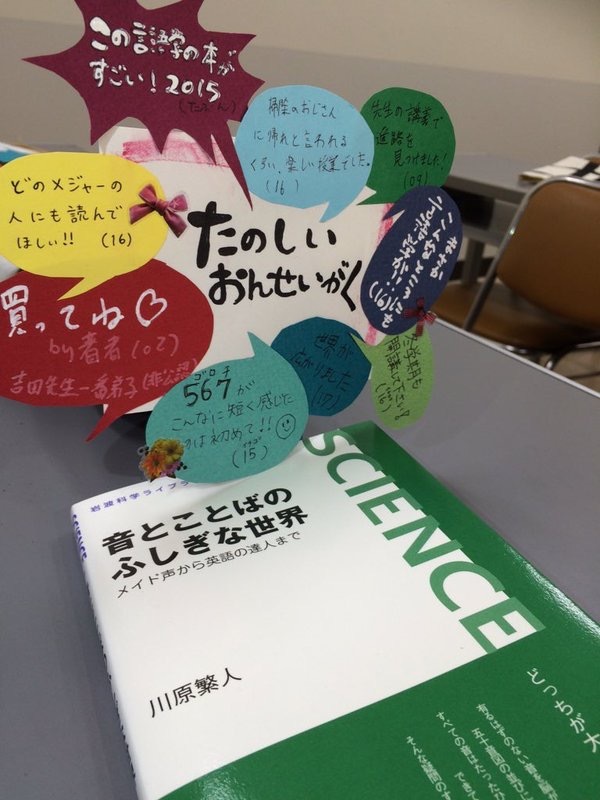 Review by M. Kitahara (2015), Studies in English Literature 56, pp.211-218. Review by A. Hosseini (2014), English Linguistics. Kawahara, Shigeto (2012) The intonation of nominal parentheticals in Japanese. In T. Borowsky, S. Kawahara, T. Shinya and M. Sugahara (eds.) Prosody Matters. Equinox: London. pp. 304-340. Gallagher, Gillian, Peter Graﬀ, Kawahara, Shigeto, and Michael Kenstowicz (eds.) (2012) Phonological Similarity: Perceptual and Articulatory Bases and Links to Grammatical Mechanisms. A special volume of Lingua 122(2). Braver, Aaron and Shigeto, Kawahara (2012) Complete and incomplete neutralization in Japanese monomoraic lengthening. Ms., Rutgers University. Kingston, John, Kawahara, Shigeto, Daniel Mash and Della Chambless (2011) Auditory contrast versus compensation for coarticulation: Data from Japanese and English listeners. Language and Speech. 54(4): 496-522. Kawahara, Shigeto (2011) Japanese loanword devoicing revisited: A rating study. Natural Language and Linguistic Theory. 29(3): 705-723. Kawahara, Shigeto (2011) Aspects of Japanese loanword devoicing. Journal of East Asian Linguistics 20(2): 169–194. Kawahara, Shigeto (2011) Experimental approaches in theoretical phonology. In M. van Oostendorp, C. Ewen, E. Hume, and K.Rice (eds.) The Blackwell Companion to Phonology. Wiley-Blackwell. pp. 2283-2303. Kawahara, Shigeto and Kazuko Shinohara (2011) Phonetic and psycholinguistic prominences in pun formation: Experimental evidence for positional faithfulness. In M. den Dikken and W. McClure (eds.) Japanese/Korean Linguistics 18. Stanford: CSLI. pp.177-188. Hara, Yurie, Kawahara, Shigeto, and Yuli Feng (2011) Emphatic stress as epistemic conflict: A case study of Mandarin Chinese. Proceedings of Logic and Engineering of Natural Language Semantics 8: 13-26. Kawahara, Shigeto (2011) Modes of phonological judgment. Ms., Rutgers University. Kawahara, Shigeto and Kazuko Shinohara (2010) Calculating vocalic similarity through puns. Journal of the Phonetic Society of Japan 13(3): 101-110. Shinohara, Kazuko and Kawahara, Shigeto (2010) Syllable intrusion in Japanese puns, dajare. Proceeding of the 10th meeting of Japan Cognitive Linguistics Association. pp. 313-322. Kawahara, Shigeto and Kelly Garvey (2010) Testing the p-map hypothesis: Coda devoicing. Ms. Rutgers University. Kingston, John, Kawahara, Shigeto, Della Chambless, Daniel Mash and Eve Brenner-Alsop (2009) Contextual effects on the perception of duration. Journal of Phonetics. 37.3: 297-320. Kawahara, Shigeto (2009) Faithfulness, correspondence, perceptual similarity: Hypotheses and experiments. Journal of the Phonetic Society of Japan. 13.2: 52-61. Kawahara, Shigeto and Kazuko Shinohara (2009) The role of psychoacoustic similarity in Japanese puns: A corpus study. Journal of Linguistics. 45.1: 111-138. Kawahara, Shigeto and Yurie Hara (2009) Hiatus resolution in Hiroshima Japanese. In M. Abdurrahman, A. Schardl, and M. Walkow (eds.) Proceedings of NELS 38. pp. 475-486. Amherst: GLSA. 篠原和子・川原繁人（2009）音象徴の言語間比較:有声性のイメージに関する実験研究. Proceedings of Japan Cognitive Science Society. Kawahara, Shigeto and Takahito Shinya (2008) The intonation of gapping and coordination in Japanese: Evidence for Intonational Phrase and Utterance. Phonetica 65.1-2: 62-105. Kawahara, Shigeto (2008) Phonetic naturalness and unnaturalness in Japanese loanword phonology. Journal of East Asian Linguistics (JEAL) 17.4: 317-330. Hara Yurie and Kawahara, Shigeto (2008) Deaccenting, MAXIMIZE PRESUPPOSITION, and evidential scale . In Proceedings of the fourth international conference on speech prosody. Kawahara, Shigeto and Kazuko Shinohara (2008) A cross-linguistic study of sound symbolism: the case of voicing. A poster presented at Language, Communication, and Cognition. Brighton University. Kawahara, Shigeto (2007) Half rhymes in Japanese rap lyrics and knowledge of similarity. Journal of East Asian Linguistics (JEAL) 16.2: 113-144. Eratta. Gelbart, Ben and Kawahara, Shigeto (2007) Lexical cues to foreignness in Japanese. In Proceedings of Formal Approaches to Japanese Linguistics 4: 49-60. MIT Working Papers in Linguistics. Cambridge: MITWPL. Kawahara, Shigeto (2007) Copying and spreading in phonological theory: Evidence from echo epenthesis. In University of Massachusetts Occasional Papers in Linguistics 32: Papers in Optimality III. 111-143. Amherst: GLSA. Kawahara, Shigeto (2007) Sonorancy and geminacy . In University of Massachusetts Occasional Papers in Linguistics 32: Papaers in Optimality III. 145-186. Amherst: GLSA [This paper has been superseded by Kawahara, Pangilinan, and Garvey (2011) above.]. Kawahara, Shigeto (2006) A faithfulness ranking projected from a perceptibility scale: The case of [+voice] in Japanese. Language 82.3: 536-574. Kawahara, Shigeto (2006) Mimetic gemination in Japanese: A challenge for Evolutionary Phonology. Theoretical Linguistics 32.3: 411-424. Kawahara, Shigeto (2005) Voicing and geminacy in Japanese: An acoustic and perceptual study. In K. Flack and S. Kawahara (eds.) 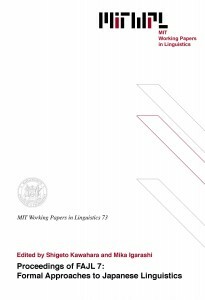 University of Massachusetts Occasional Papers in Linguistics 31: Papers in Experimental Phonetics and Phonology. pp. 87-120. Potts, Christopher, and Kawahara, Shigeto (2005) Japanese honorifics as emotive definite descriptions. Proceedings of SALT 14: 253-270. Kawahara, Shigeto (ed.) 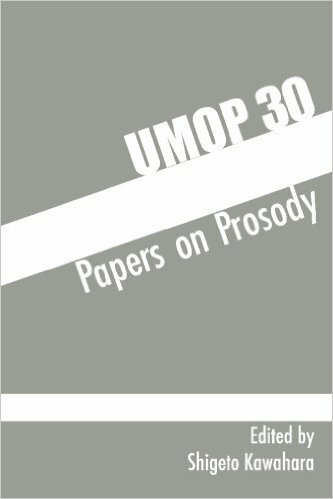 (2005) University of Massachusetts Occasional Papers in Linguistics 30: Papers on Prosody. ISBN: 1-4196-0680-8. Kawahara, Shigeto (2004) Locality in echo epenthesis: Comparison with reduplication. Proceedings of the North East Linguistics Society 34: 295-309. Shinya, Takahito, Elisabeth Selkirk and Kawahara, Shigeto (2004) Rhythmic boost and recursive minor phrase in Japanese. In Proceedings of the second international conference on speech prosody. 183-186. Selkirk, Elisabeth, Takahito Shinya, and Kawahara, Shigeto (2004) Phonological and phonetic effects of minor phrase length on f0 in Japanese. In Proceedings of the second international conference on speech prosody. 345-348. Kawahara, Shigeto, Kohei Nishimura, and Hajime Ono (2003) Unveiling the unmarkedness of Sino-Japanese. In Japanese/Korean Linguistics 12: 140-151. Stanford: CSLI. 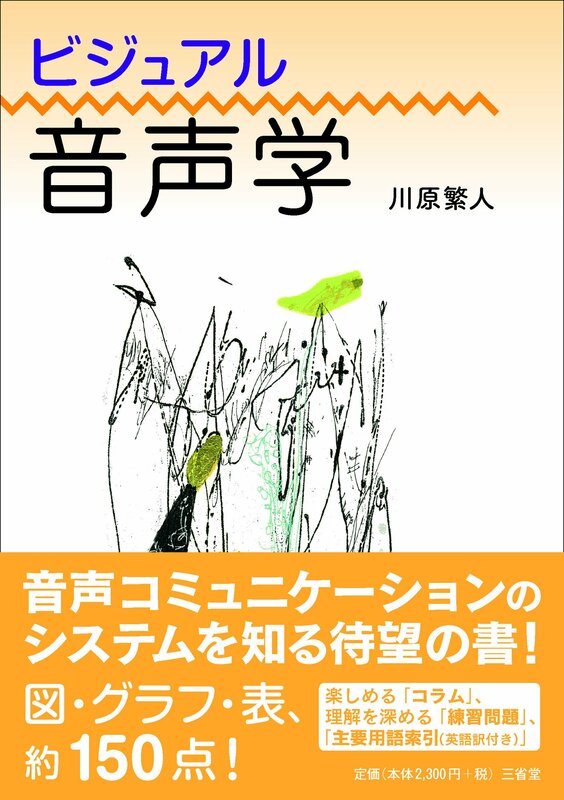 Kawahara, Shigeto, Makoto Kadowaki and Kazuko Yatsushiro (2003) A gap in the interpretation of embedded tense in Japanese. In Snippets 7: 11-12. Kadowaki, Makoto and Kawahara, Shigeto (eds.) (2003) Proceedings of NELS 33. ISBN: 1-4196-2201-3. Kawahara, Shigeto (2002) Similarity among Variants: Output-Variant Correspondence. BA Thesis: International Christian University. Kawahara, Shigeto (2002) Aspects of Japanese hip-hop rhymes: What they reveal about the structure of Japanese. In Proceedings of Language Study Workshop. Kaneko, Ikuyo and Kawahara, Shigeto (2002) Positional faithfulness theory and the emergence of the unmarked: The case of Kagoshima Japanese. In Akira Nakayama (ed.) ICU English Studies 11: 18-36. This site and its contents are © 2010 by Kawahara, Shigeto.